Sagpaita is simply a dal cooked with winter greens. As I mentioned in the bathue ka sagpaita recipe, dals are rarely cooked without greens in winters. 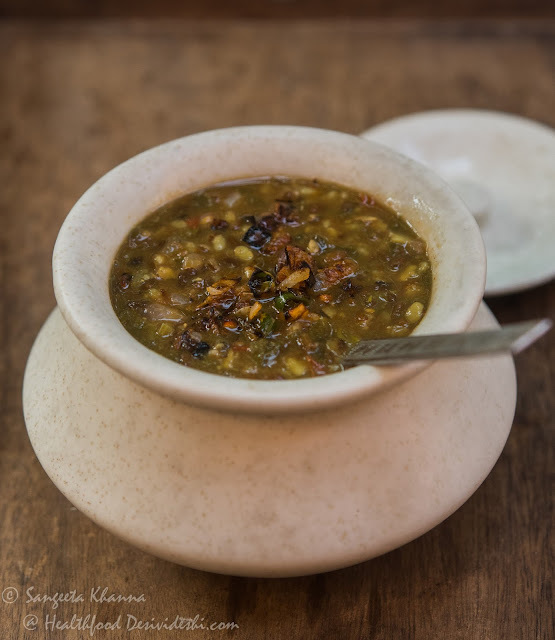 Many times the dals are replaced by the various nimonas and sometimes people even replace the everyday dal with rajma or chhole to be had with plain boiled rice. Those are some of the comfort foods for many of us and rajma chawal, chhole chawal, nimona chawal or sagpaita chawal kind of meals bring back the memories from childhood till date. 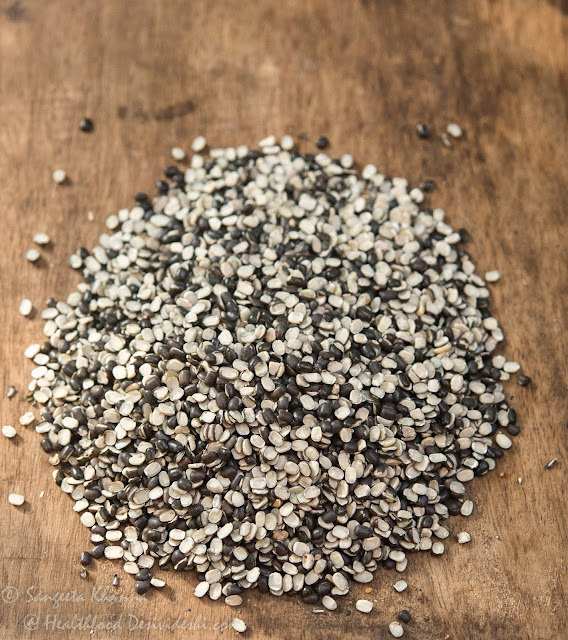 Urad dal (black lentils) are consumed a lot during winters for all traditional recipes of khichdi, dals and of course the badas and badis of different types. Mung and masoor are the easily digestible dals chosen for summer meals while chana dal and urad dal are common winter foods. Other dals also keep featuring in various permutation combinations and there are various names for all the dals we eat. 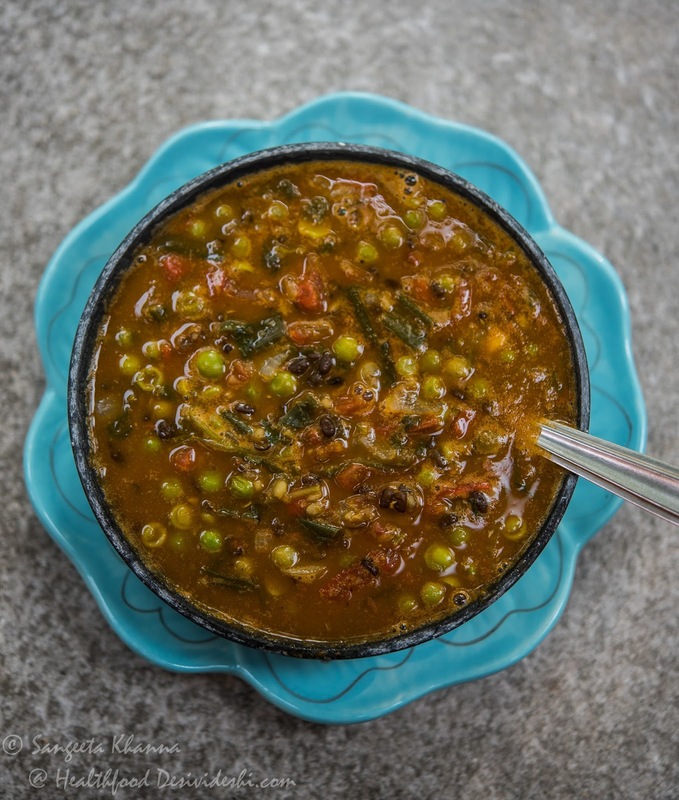 A cook's prowess is often measured by how well he/she cooks a dal and there are many old kahavats (sayings) featuring the humble dal, it can be such a homely dish that can be adapted to just about anything. 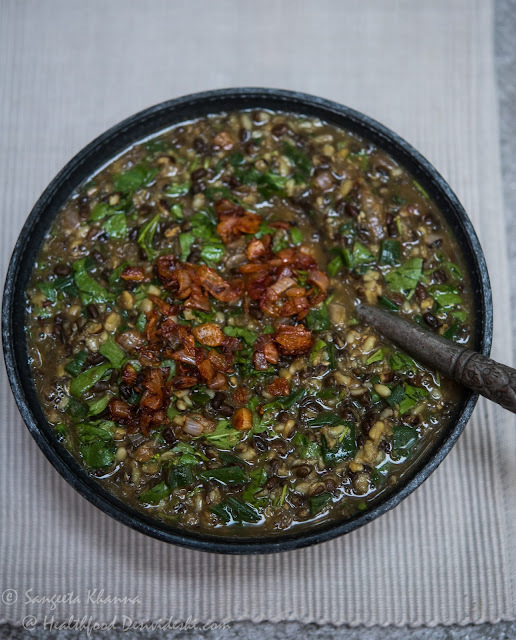 We used split urad dal with skin for this recipe of urad dal ka nimona and the common greens used for this are spinach, bathua of chenopodium, or a mix of all seasonal greens, each one imparting a new dimension to this sagpaita. I often add a handful of tender carrot leaves or spring onion greens to add more flavour to the sagpaita. Feel free to add any greens you like but spinach or bathua taste the best with a little added carrot leaves, spring onion, dill leaves or even a bit of fenugreek leaves. Pressure cook the split urad dal with salt, turmeric powder, ginger and a cup of water. It takes about 10 minutes after the first whistle. Lower the heat after the first whistle to let the dal cook. Let the pressure release on its own. In the meanwhile prepare for the tadka and you can cook the rice etc to go with the dal. Open the lid of the pressure cooker and add all the chopped greens, mix well and place the lid back. The greens will get cooked in the remaining heat. For the tadka, heat the ghee in a pan, add the asafoetida, cumin seeds, garlic and onions in that order, waiting in between to let the aromas infuse in the oil. Brown the onions lightly. Add the curry powder as soon as the onions brown, mix quickly and dunk the chopped tomatoes in it. Add a little salt and cover to cook the tomatoes thoroughly on low heat. This takes about 4-5 minutes. Now pour the dal and greens mix to the tadka pan, mix well, add some water to adjust consistency and simmer for a couple of minutes before serving. This sagpaita tastes really good with plain boiled rice and makes hot comfort food in winters. I always remember eating hot dal chawal in a bowl and I still do that. Now I have huge breakfast mugs that I use for me soup meals o dal chawal meals, sagpaita and chawal meals also come in the same category. You really don't need anything else with this sagpaita and rice meal but the traditional bhujias, roasted papad and raita etc are pleasant additions always. Sometimes I add lot of tomatoes and some green peas too in the tadka and cook them thoroughly before adding to the sagpaita. Variations always feel good in such everyday recipes and sometimes leftover dals can also be turned into sagpaita with just the tadka and some tomatoes and winter greens added. It always feels good to cook something our grandparents have been eating and most certainly their grandparents ate the same too. It is in the last 2-3 decades that our food habits have changed so much that many of us have forgotten cooking from scratch, using real ingredients and not sauces, mixes and blends. My motive is to bring back the food wisdom on the table everyday. We need to realise that simpler foods are the tastiest and stay in our memory for ever. A curry loaded with a hundred spices gets lost in the memory lanes. Try recollecting your food memories and you will know what I mean.